Welcome to part 3 of the ongoing saga of I Know What I Like. Check out parts 1 and 2 if you have even more time to waste. 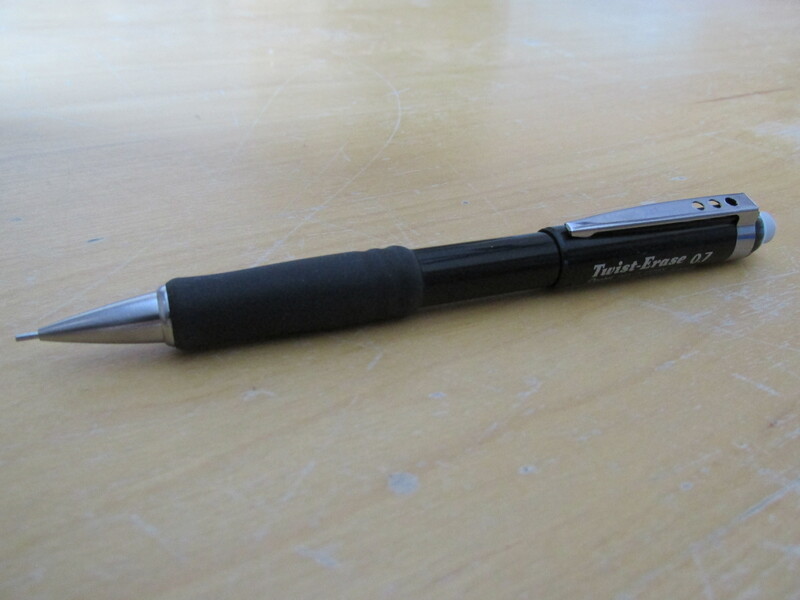 I cover pens that have fallen out of favor in those previous installments. Today, we’ll cover the pens that have made the cut. Before getting to the list of pens that have made it behind the velvet rope, let me just say that this narrowing process has been interesting and frustrating. Interesting because it made me assess what I like and how I actually use writing tools. The fact of the matter is that I do not have a lot of use cases for fountain pens. I just don’t, and I do not want to make you think I use fountains pen more than I do. It has been frustrating because, depending upon the day and my particular mood, a given pen may just make or miss the cut. Ultimately, this part 3 of I Know What I Like covers writing tools that, many more days than not, make the short list. Yes, I may flirt with other options but time and time again I find myself coming back to these choices. In an attempt to be fair, informative and easy to read, I limit myself to mentioning a few pros and cons of each item. Just know that, in my final estimation, the pros outweigh the cons for each item. Just look at it! A near perfect balance of sharpness and simplicity. I actually have an all blue K405 headed my way that I think I might like even more. Takes the Parker Quinkflow refill. Yes, Parker Quinkflow may be boring and the blue ink may be a touch too purple, but it works for me. The diameter of this pen is just about perfect for me. It is a touch (just a touch) too light. If it were ~1 gram heavier it would be perfect. The clip on my K405 is not quite tight enough. It sits fine in a shirt pocket, but it can come loose if kept in a front jeans pocket as is my preference. 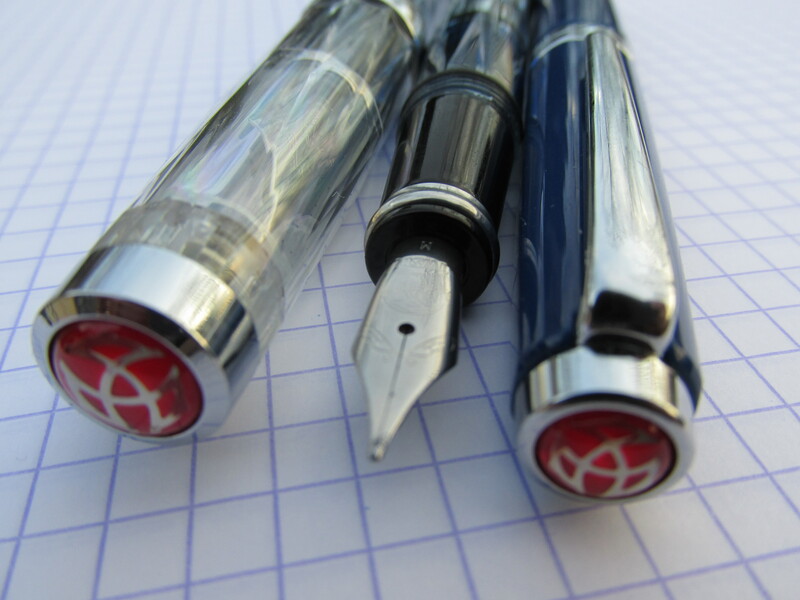 TWSBI stainless steel nibs offer great price-to-quality ratios and the Eco uses nibs I have from other TWSBI pens. 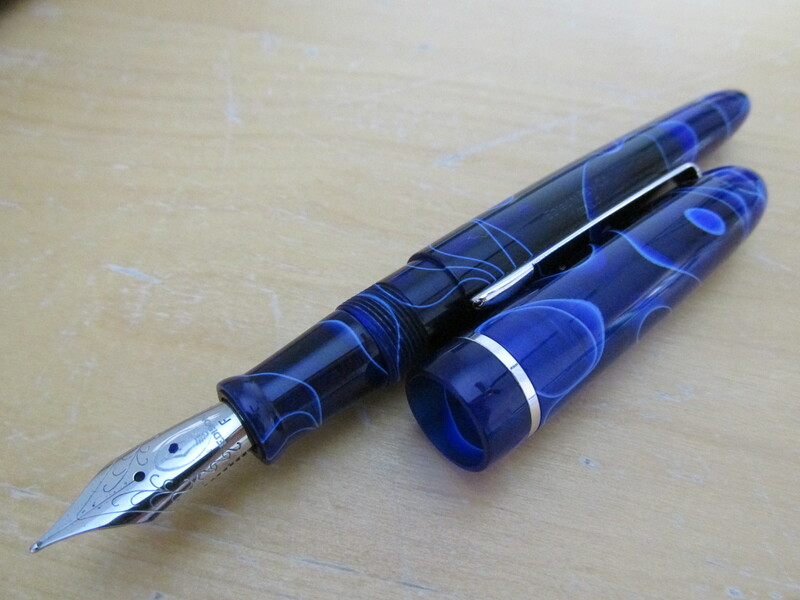 Probably the best made fountain pen TWSBI produces. 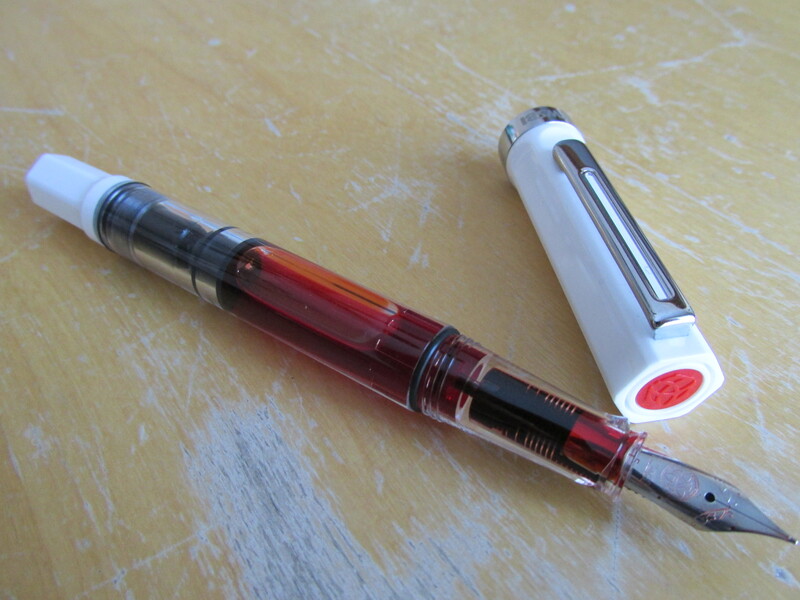 Unlike other TWSBIs, quality control does not seem to be an issue with this TWSBI edition. Feels great in my hand. I want to be in full control of a pen when I hold it. No slipperiness please! The Eco delivers on this point big time. 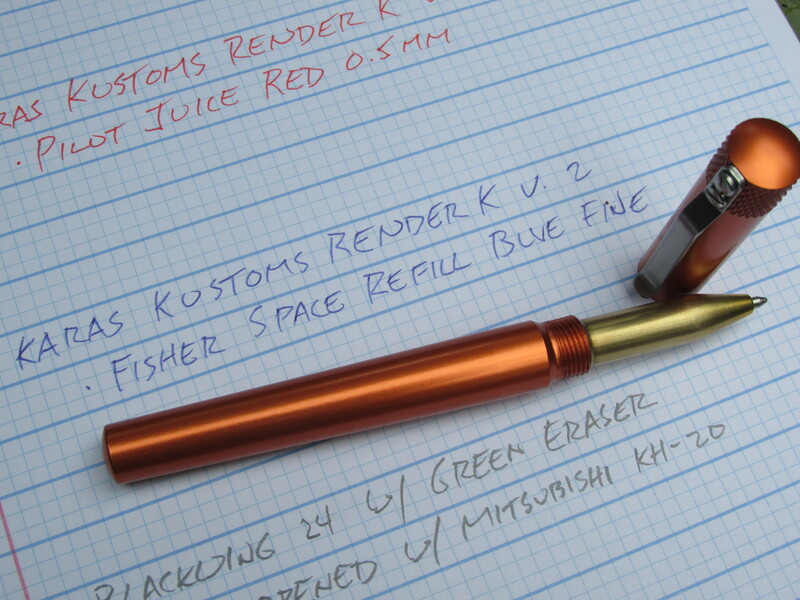 Piston filler on a fairly inexpensive pen is cool. Not the best looking pen I own. The “chunky” cap is a bit of a mismatch for the body and the reliance of rubber rings is a bit cheesy. The cap can post, but it looks and feels silly when you do. I’m a lefty so I need graphite that does not smudge easily. I have tried many, many, many wood cased pencils and the Tombow Mono and Mono 100 in F offer the best balance of smudge resistance and smoothness hands down. I will not debate this point! Other opinions are simply wrong! 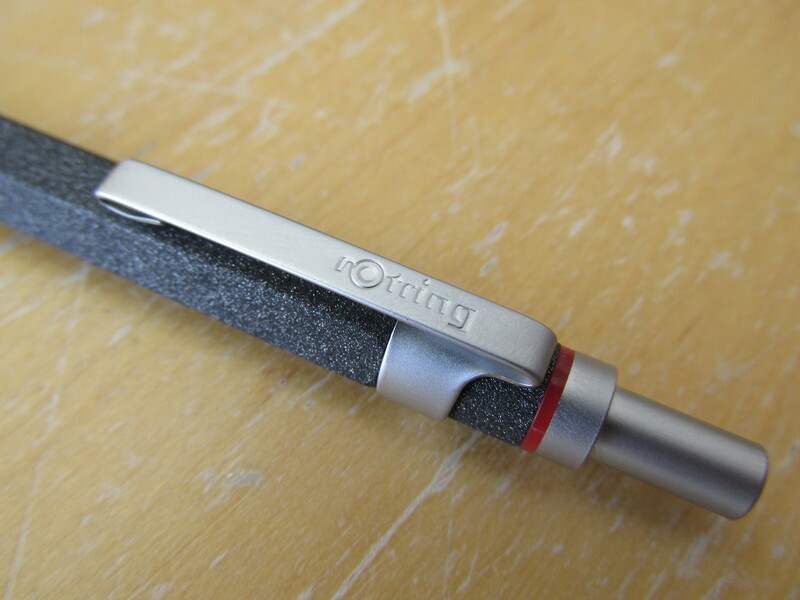 Maybe it’s the F graphite, but the point retention is superior as well. The quality control on these pencils is excellent. The graphite is always centered, the wood sharpens perfectly each and every time and the finish of every Mono or Mono 100 I own is as good as the next. It does not have an eraser. Some people don’t care about this. I do, but only a little. As you can see, I popped an eraser cap on mine. This does detract from the look a bit but I’m okay with that. Not dirt cheap (~$1.20 per pencil on Amazon). The grip material and diameter work well for me. These pencils got me through calculus, chemistry and physics tests back in the day so I think shared adversity breeds a bit of fondness. The length of the pencil is almost perfect. I wish the clip were shorter or about 0.5 cm further from the point so as to completely avoid contact with my hand, but otherwise the length and balance are great. 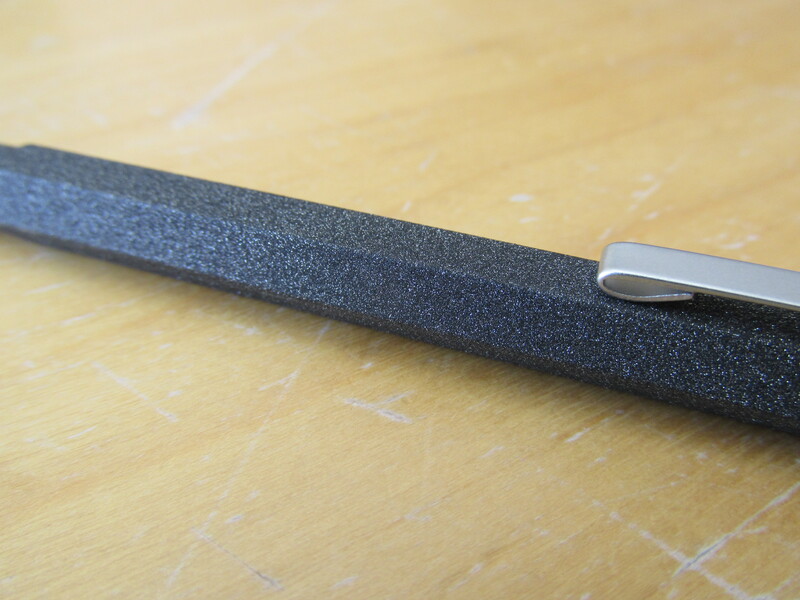 Hey look, an actual eraser that (a) erases and (b) lasts more than 5 minutes on a mechanical pencil! Very easy to find and cheap. Non-retractable tip can make it shallow-pocket unfriendly. The clip is too tight. I have to work a bit to make sure the clip slides onto a pocket. Look. At. It. Look. At. It. Again. The stainless steel nib on this pen is the best nib I have ever used. Smooth but not too smooth and never skips. The pump filling mechanism is fun. The writing experience and balance work equally well for me capped and uncapped. The hold and control I have on this pen is fantastic. This puppy was not cheap. The material has a noticeable odor that took a few weeks to dissipate. It’s a fountain pen so it does not get the use time that fully justifies its expense (that’s on me, not the pen). Classic design and color options galore! 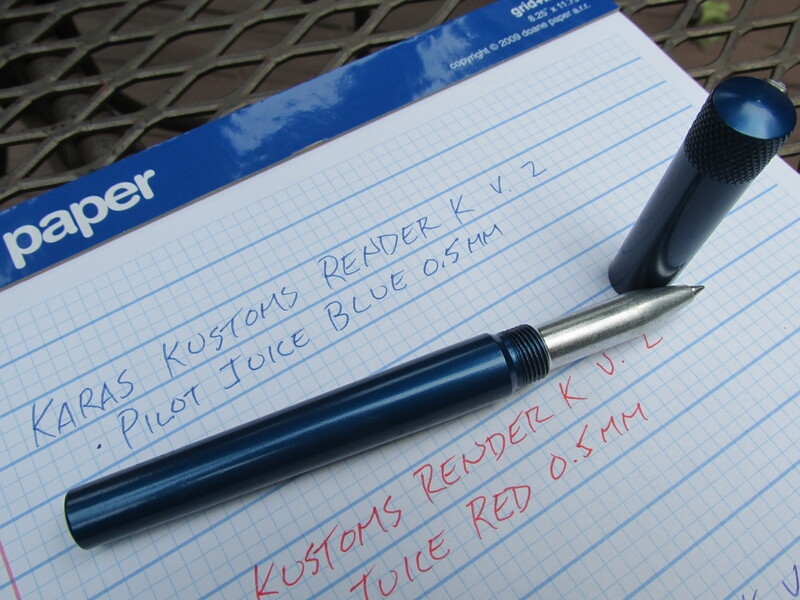 This may sound odd, but I feel more connected to the bygone days of analog workflow when using Jotters than I do with any other writing tool, including fountain pens. 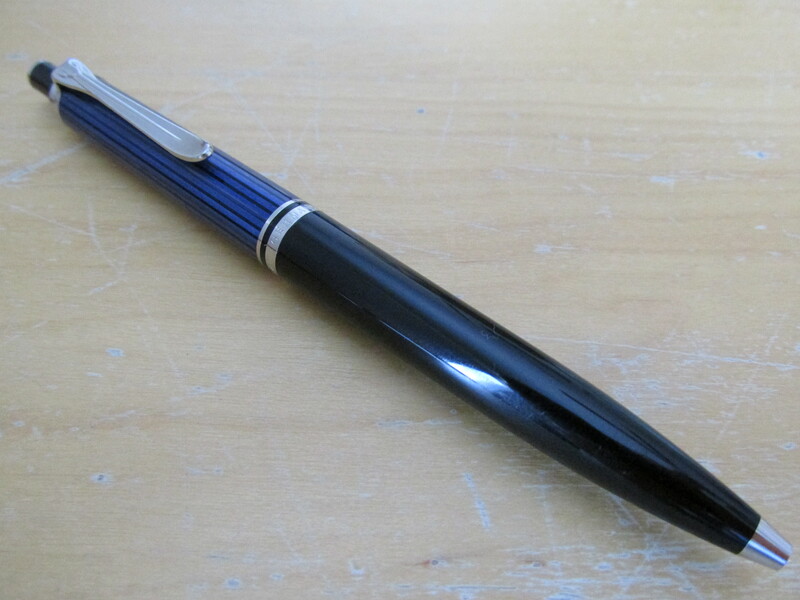 To me, a fountain pen can feel more like an extravagance than a call back to days gone by. Meanwhile, the Jotter is a more subtle and realistic connection to the past. 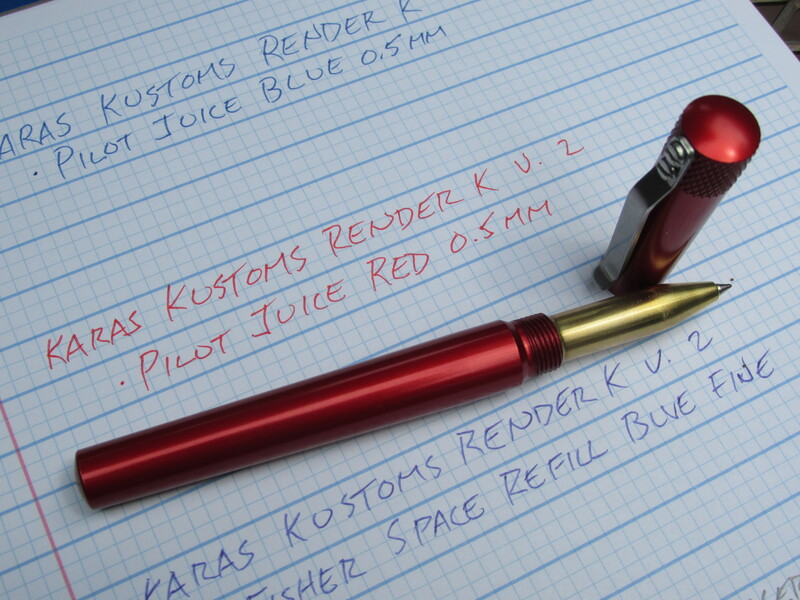 Obviously, it takes the aforementioned Parker Quinkflow refill that I prefer. Fun to collect without breaking the bank. The quality control of the older Jotters (brass threads) is outstanding. The diameter of most Jotters is on the thin side of acceptable for me. Versions with the plastic threads can feel too light and cheap. Weight, balance and grip are all near perfect for me. I do not know why, but silver rOtrings always feel too cold and slippery to my hand but the black versions, especially the 800, feel so much better. The retractable tip makes this 100% pocket safe and adds a bit of a wow factor. 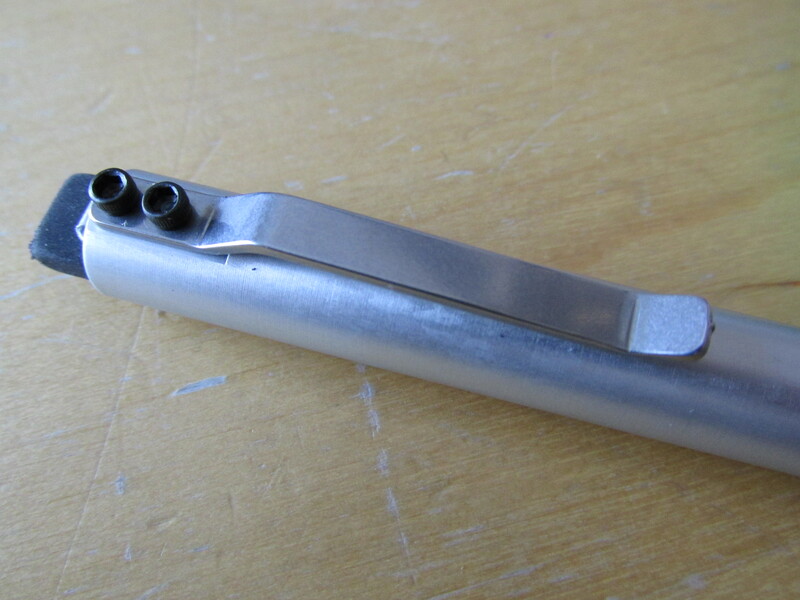 I was able to move the clip up just enough so that it does not interfere with my hand when writing. The diameter of the grip section is a hair too small for my perfect preferences. 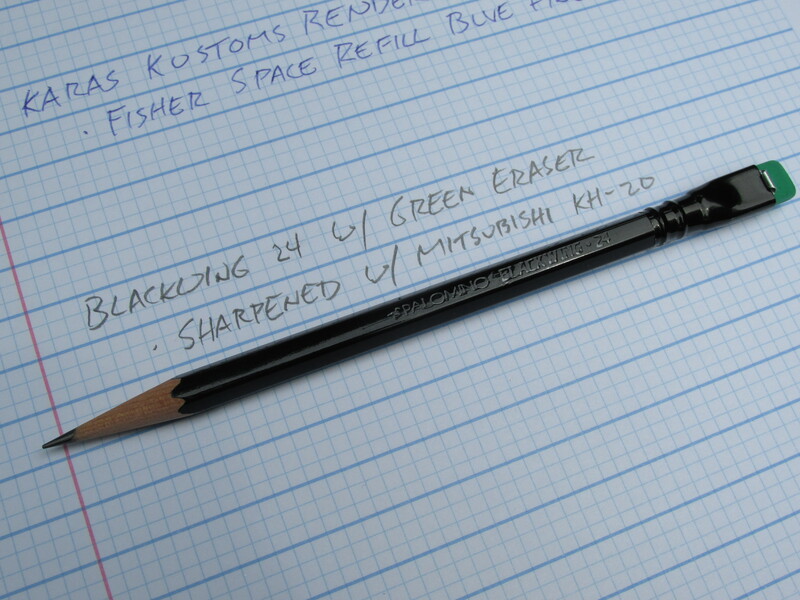 Like most mechanical pencils, the eraser is an afterthought and replacements cost more than they should. The fusion nib thing may be a bit goofy, but it works for me. Other than the nib on my Edison, this fusion nib is the best one I have in my collection and it was great right out of the box. Weight, balance (posted or unposted) and grip of this pen all work for me. The fine nib on this Delta is clearly finer than the fine nib on the Edison. If I want a true fine, I go with the Delta. If I want a medium-fine, I go with the Edison. Given that the writing experiences are similar, this Delta was a much better deal than the Edison. I’m not thrilled with the color. I did get it for a good price (relatively speaking) but picking this color was a compromise. It’s a decent color, just not ideal. 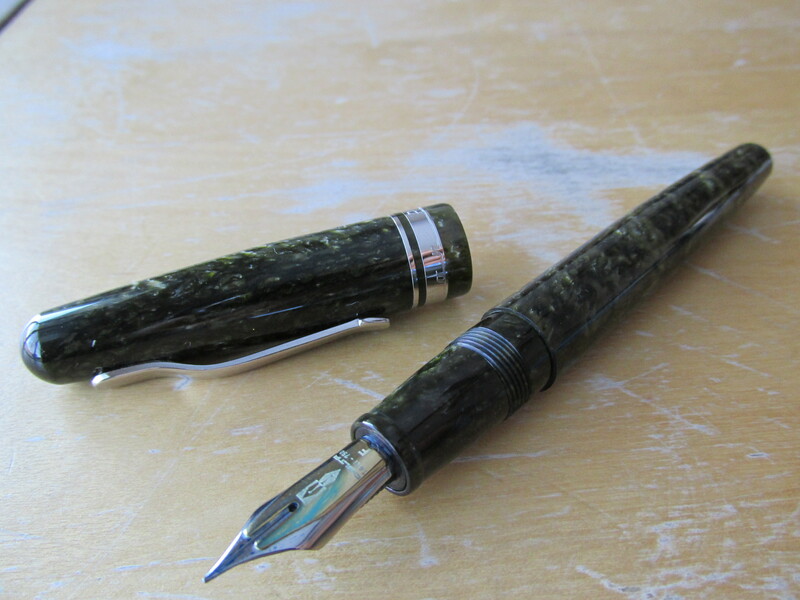 Unlike the Edison, this fountain pen does not do as well with the rough and tumble of a backpack. 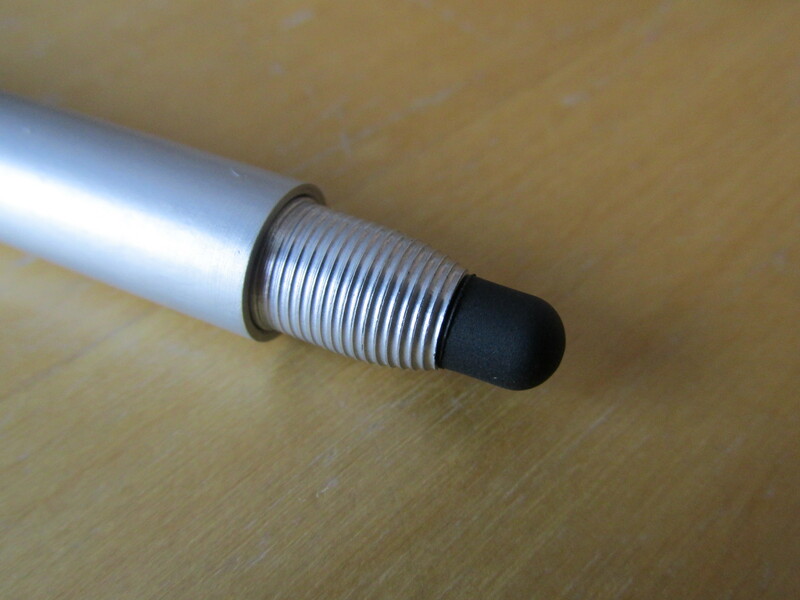 It does not really leak, but the nib and interior of the cap can get a bit inky if the pen gets knocked around a bit. 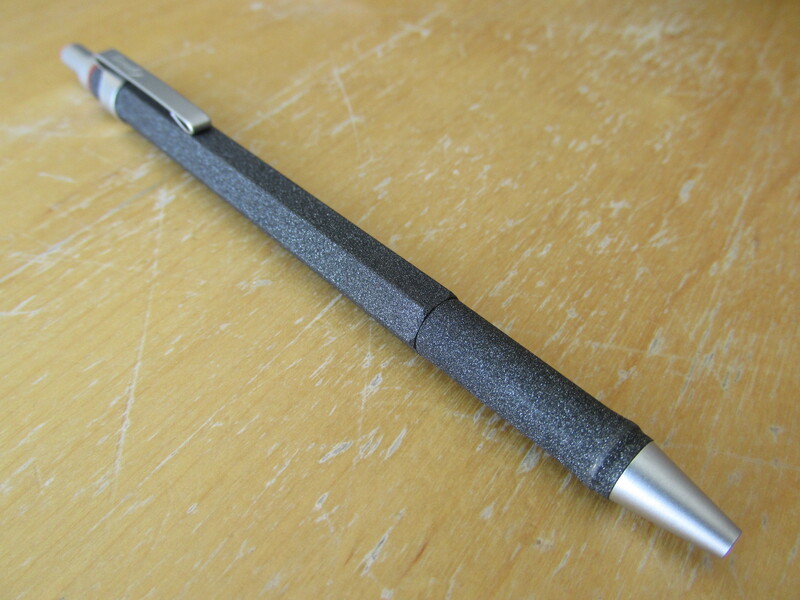 Like all the Lamy 2000 pens, the fiberglass body feels great in my hand. 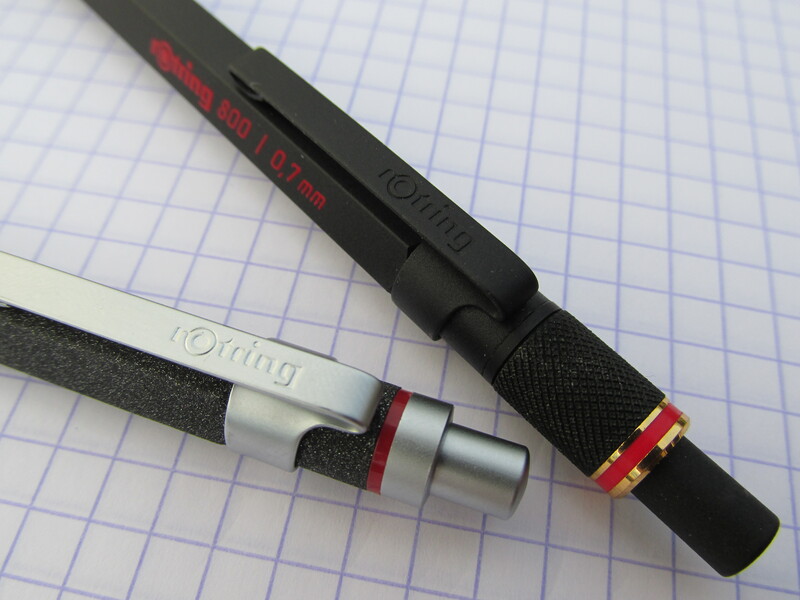 The spring clip works well – easy on, easy off without any lack of hold. The tiny metal bits on the grip section that hold the cap on can be distracting. I am past this issue but it is a thing to overcome. 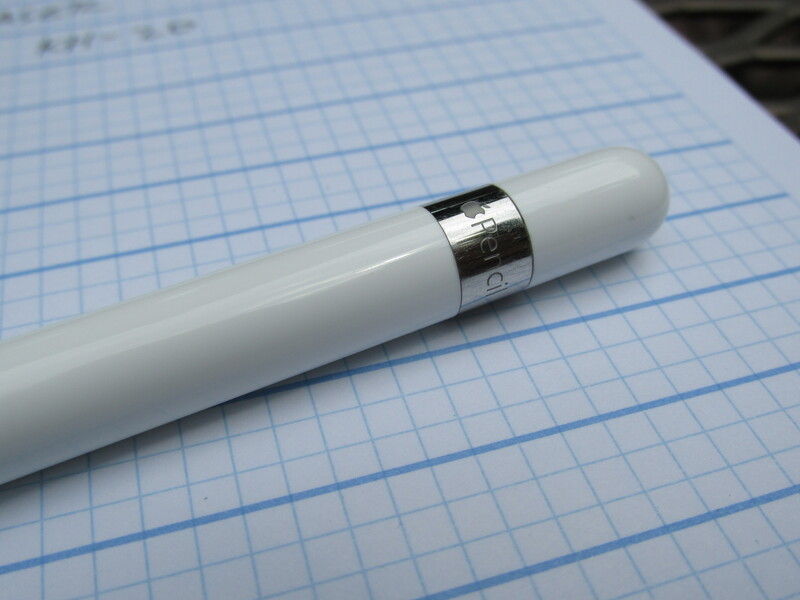 You could easily spend $100 or more for this pen. You absolutely should not. Comes in a few different colors and materials so you have options. The “sand” colored aluminum version is shown here. Metal pens can be hard to hold. The turns of the grip area are the best design answer to this issue I have seen. So simple yet so clever. 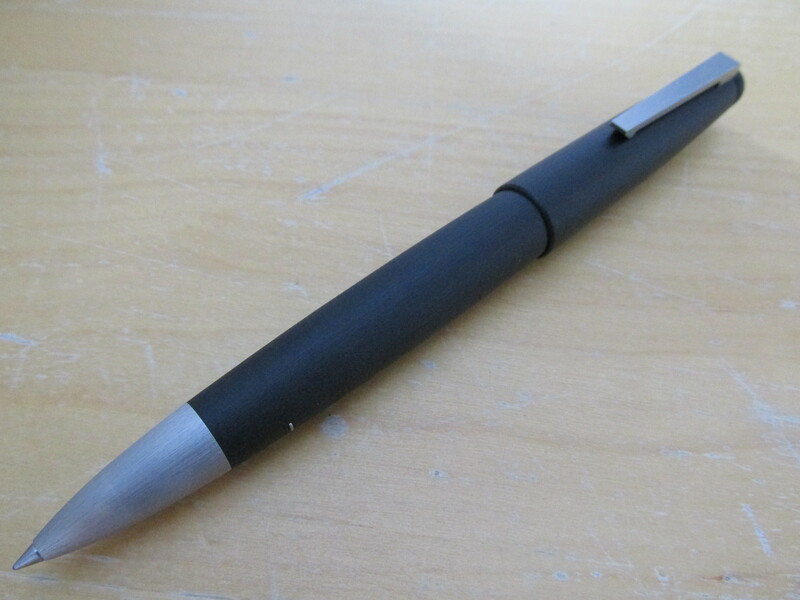 For me, this pen compliments the Lamy 2000 in that it is the retractable pen of choice for the Pilot Juice refills. 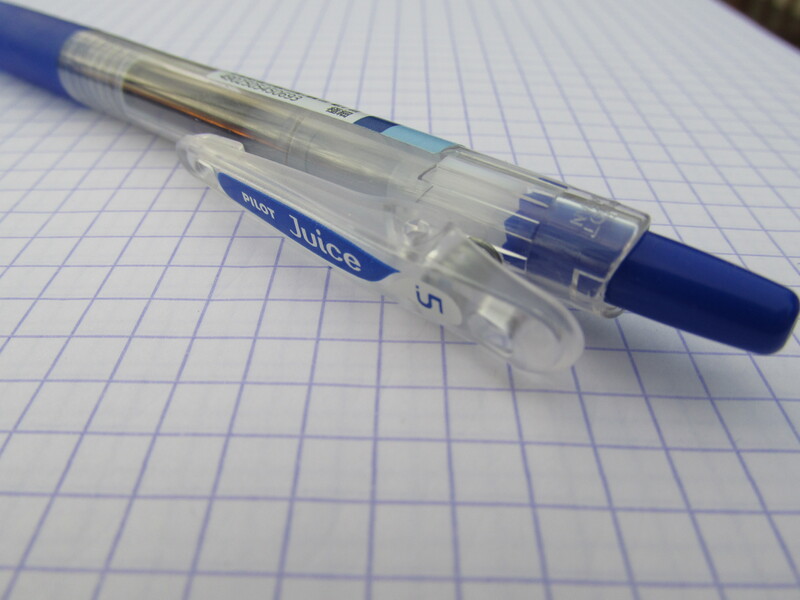 My #1 grading pen is a TT Mover with a red Juice refill. Weight and diameter generally work well for me. There are days I think it’s a touch to wide, but I’d rather it be a touch too wide than a touch too skinny. I will not call it a quality control problem, but I did return a blue Mover I bought through Massdrop to maker. To his credit, he could not have been nicer or quicker about addressing the issue. You do need to be deliberate with the knock mechanism. This is not the knock for figgidy folks. So there we have it. 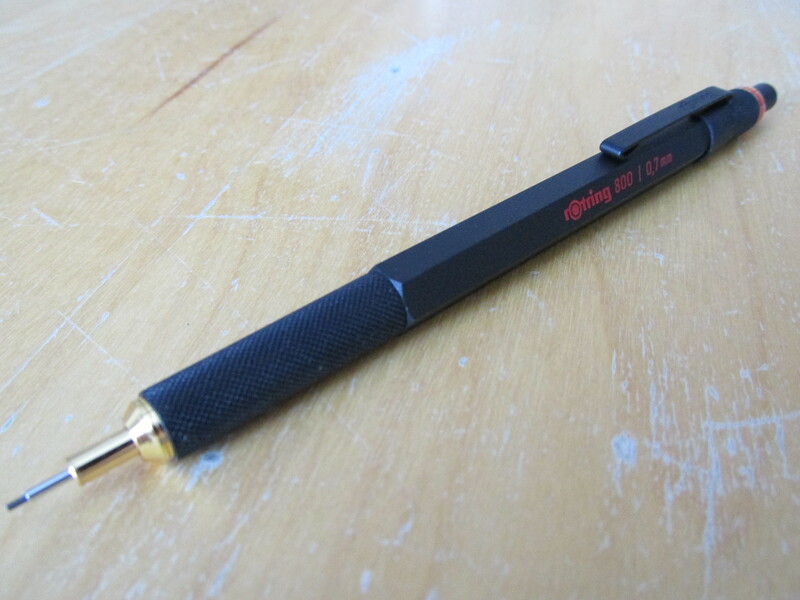 It turns out there are ten items here, so I guess we could call this my top 10 writing tools. If I never buy another pen in my life, I would be perfectly fine with these ten. I will still look for other options of course, but I will be more particular about what I buy from now on. If I do not think a pen or pencil has a chance of displacing one of these ten items, then I will likely pass on it. Pencils, wood-cased and mechanical, have always been a prominent part of the collection but I would be remiss if I did not give a shout out to the gents from the Erasable podcast. 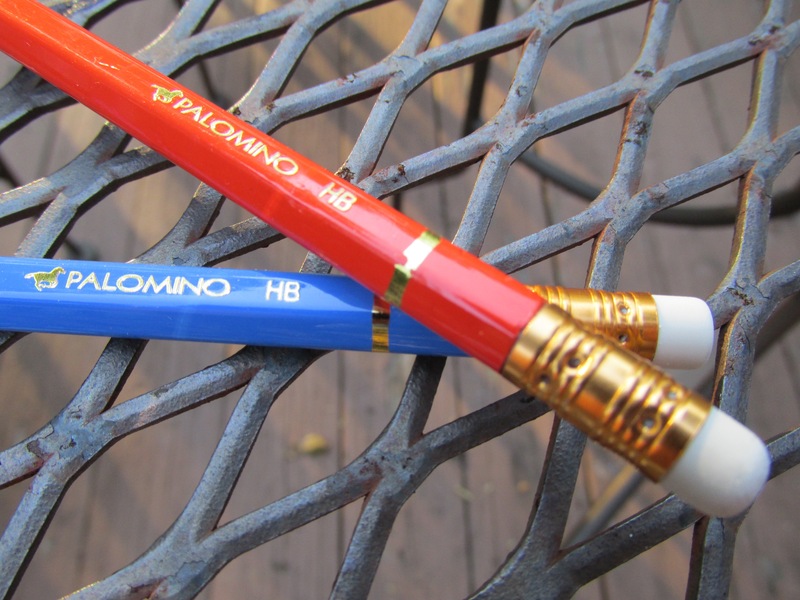 While my discovery of the Palomino HB predates this podcast, there is no doubt that those guys played a role in my pencil collection and knowledge getting larger and deeper, respectively. Anyway, as part of my quest to simplify the writing tools in my life, I spent a fair amount of time going through all the wood-cased pencils in my collection. In a previous post, I identified the Tombow Mono as my wood-cased pencil of choice. There is no doubt that it’s a great pencil but my goal to simplify has brought a change of perspective. I want a go-to pencil and the Palomino HB is that pencil. Why the Palomino and not the Tombow? Eraser, color and feel. The Palomino has an eraser and the Tombow does not. Admittedly, the eraser on the Palomino is entirely average but in the simplified world I now occupy, pencils with erasers make a lot more sense than those without. Next, the blue and orange colors of the Palomino are just great. Why would I want a black pencil with an unsightly barcode on it when I can have one in blue or orange. Lastly, the Palomino feels better in my hand than the Tombow. 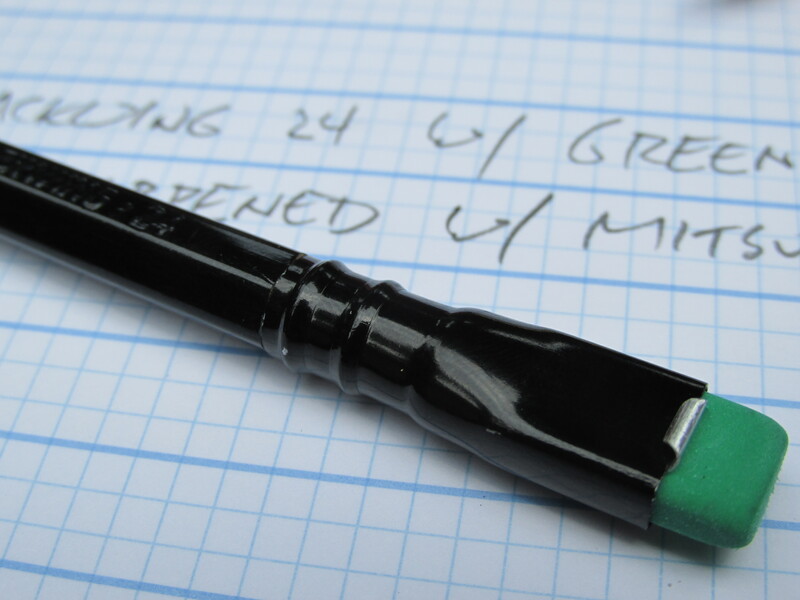 There is not anything uncomfortable about the Tombow Mono, but the rounded semi-hex cut along with the smooth yet tactile finish of the Palomino makes it one of the most comfortable writing implements, pen or pencil, I own. 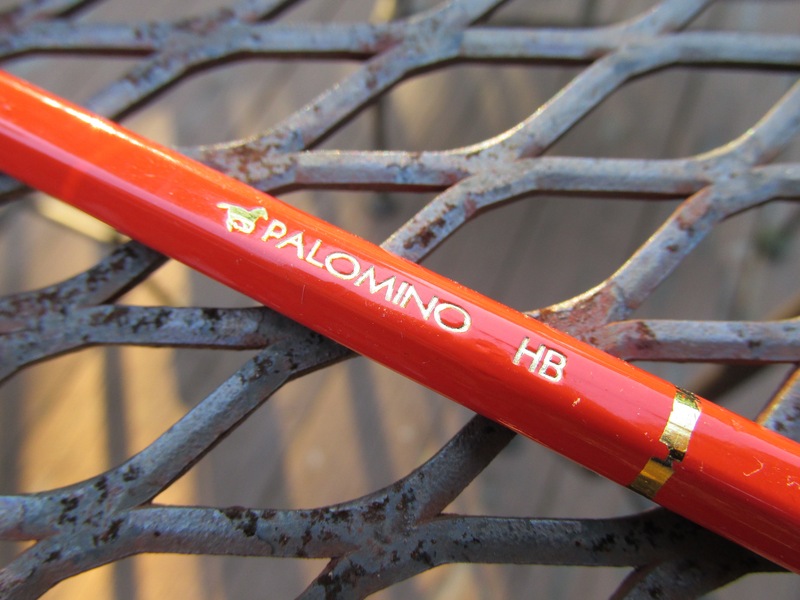 In the world of HB pencils, the Palomino HB is a touch on the softer side but clearly not as soft as standard-issue B graphite. 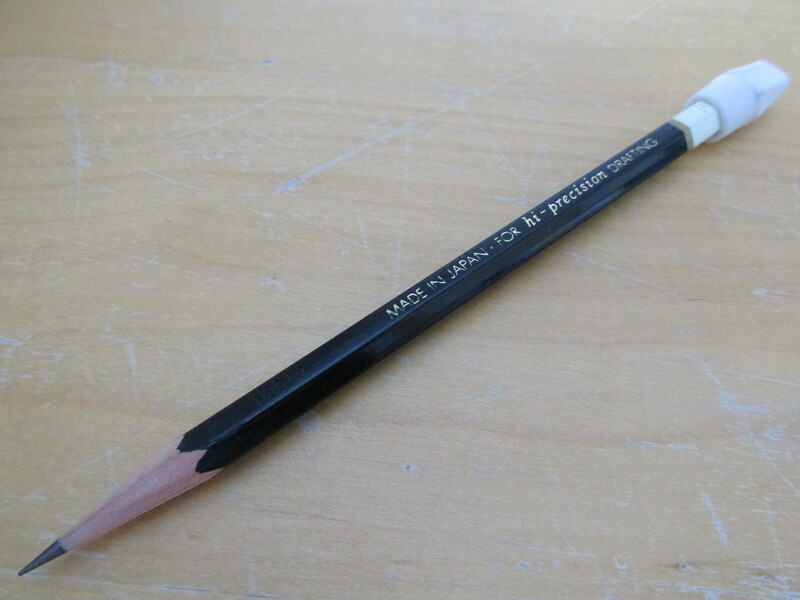 They should label the pencil as hB to accurately depict its graphite grade. 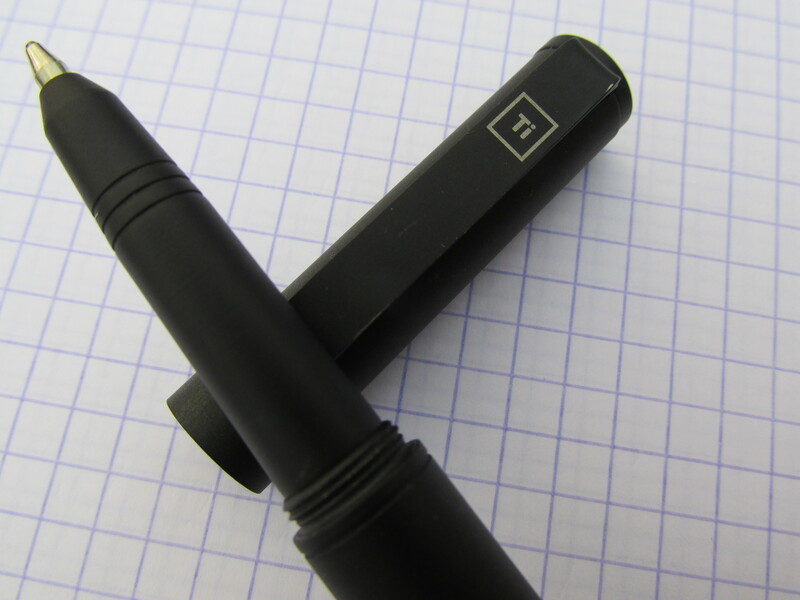 Importantly, the point retention of the hB graphite is rather impressive. To be honest, I like the slightly harder (therefore slightly better at point retention) graphite of the Tombow HB a bit better but the difference is ever so slight. I guess my perfect pencil would be a combination of the Tombow Mono HB graphite with the Palomino HB body and eraser (let’s call it the Talominobow HB). …I retired my desktop at school and now just rely on my MacBook Air and a docking station (Windows…you may be dead to me now). Anyway, back to writing implements. All writing tools come with compromises. 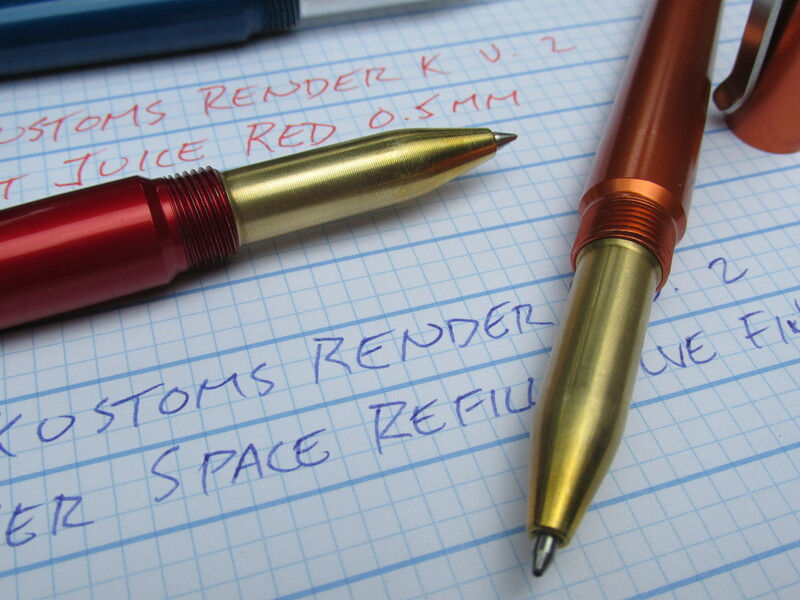 Fountain pens have wonderful historical appeal and deliver an effortless, expressive and personalizes writing experience when everything goes well. But, things don’t always go well and you need to be a bit fussy about the paper you use. Gel pens, with their great ink colors and variety of point sizes, may be the best thing to happen to pens in the last 20 years but ink quality varies and refill life is typically low. Among ink pens, ball points write on the widest array of paper types, have a 20th century history all their own and have undergone a recent revival thanks to advances in ink formulations. 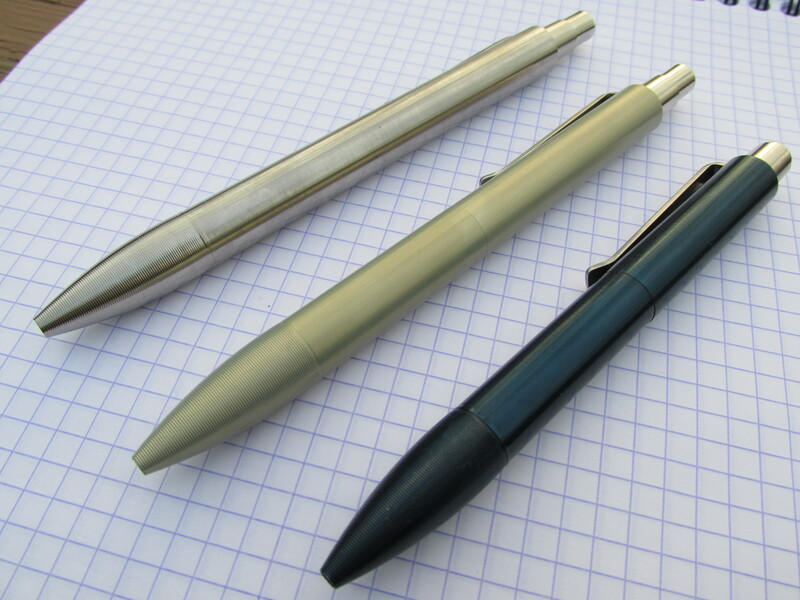 Then again, many folks find ball points utilitarian, soulless, unremarkable and indistinguishable. Which brings me to mechanical pencils. 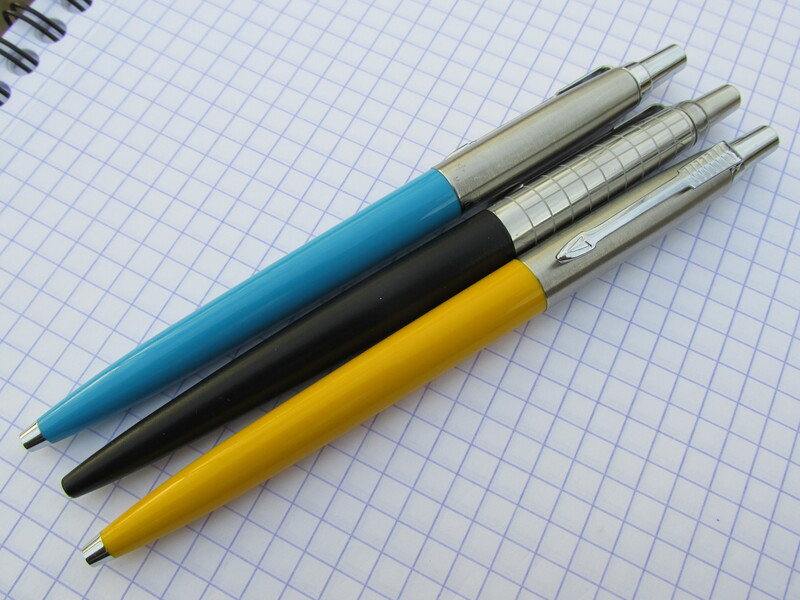 Could it be that mechanical pencils offer a number of positives we seek in our writing toys and fewer of the drawbacks? By choosing your preferred graphite hardness (4B, 3B, 2B… 2H, etc.) 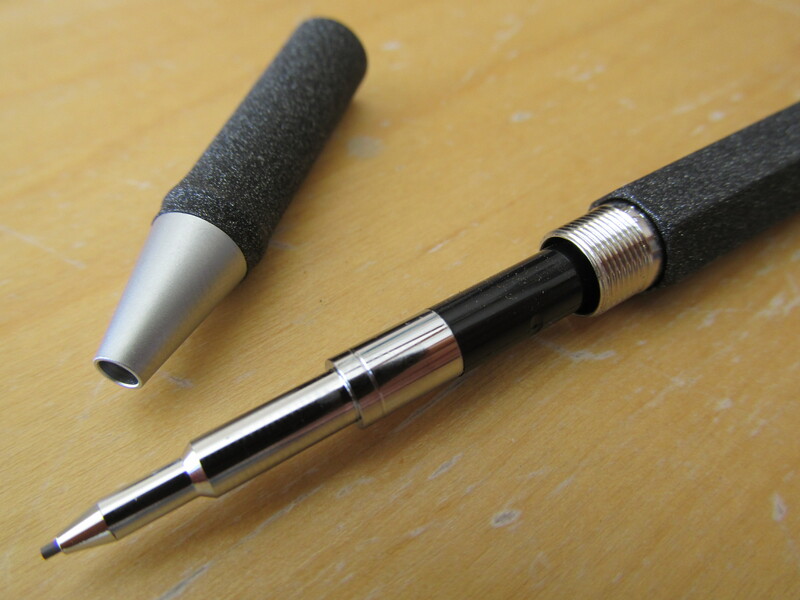 in a particular diameter you get a pencil that is your own. 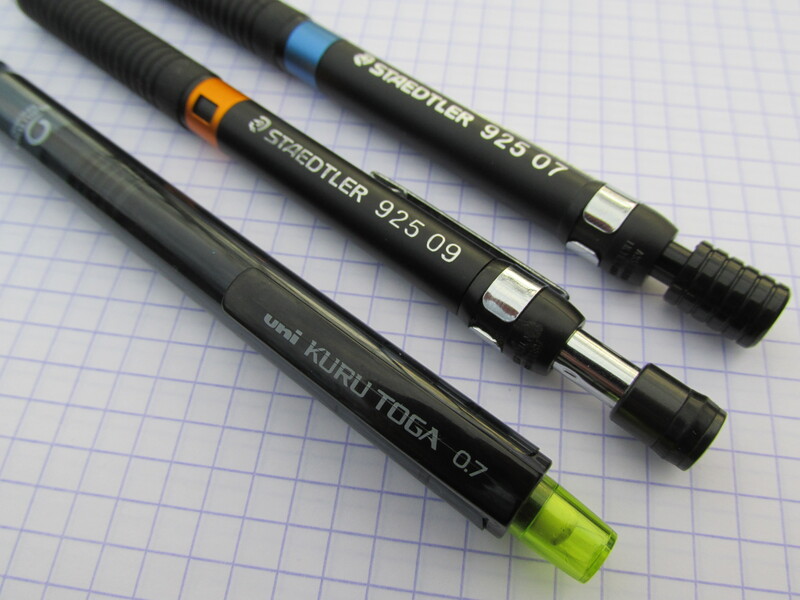 While mechanical pencils have the occasional mechanical problem, most issued are easily solved without the services of a “meister” of any sort. Sure, graphite might break but it doesn’t leak or stain and I have yet to find a piece of paper that pencil won’t mark. What about wood-case pencils you ask? They’re great. Is there anything more iconic than the yellow pencil? 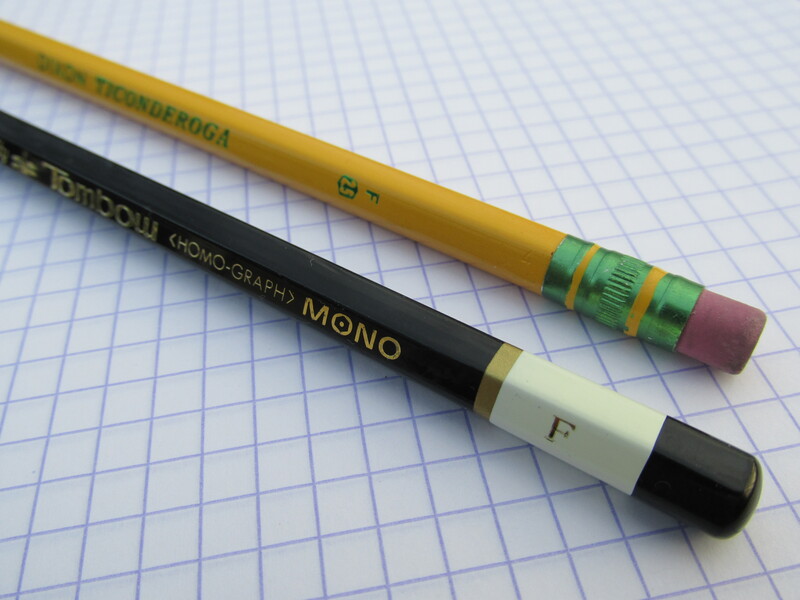 If you came to my house and stole my Tombo Mono (F) pencils, I would hunt you down like the dog you are. But, wood-cased pencils are not terribly portable and you always need something else in hand, namely a sharpener, to get them to work. I’m not here to bang on wood-case pencils, but think about it. 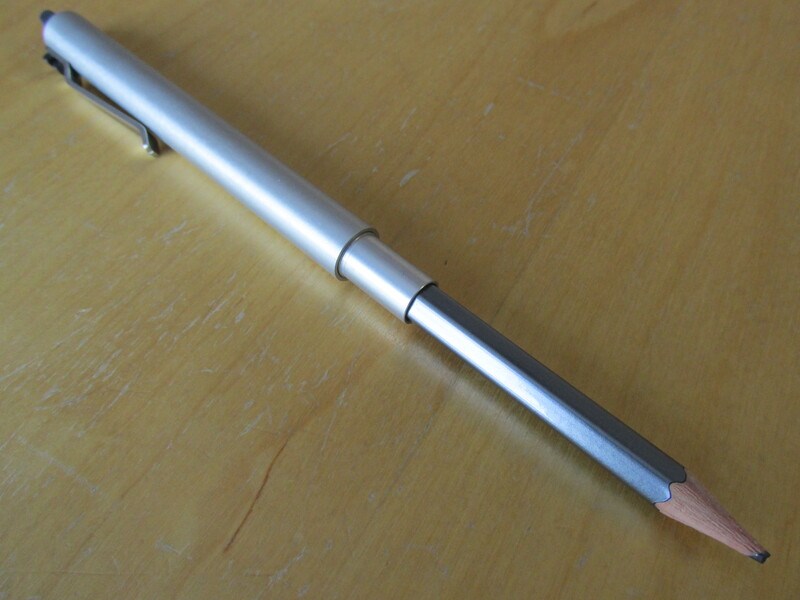 Unlike a brand new pen, a brand new wood-case pencil is useless unless you have the other thing. Obviously it’s not a big deal but it’s still a thing. So, as part of my simplified life I’m going back to mechanical pencils. 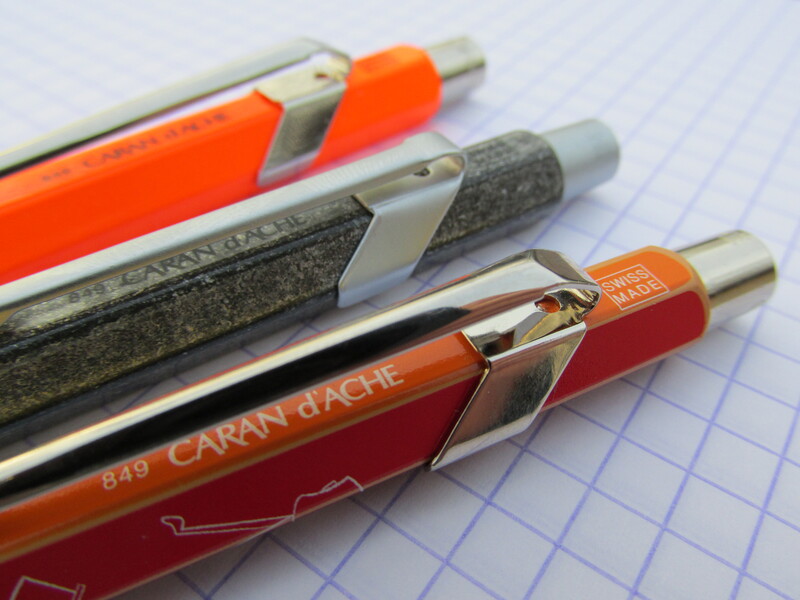 (I also find myself gravitating towards simple and efficient pen designs like the Caran d’Ache 849. More on that later.) I hope, dear reader, that you will indulge me a bit in this effort. 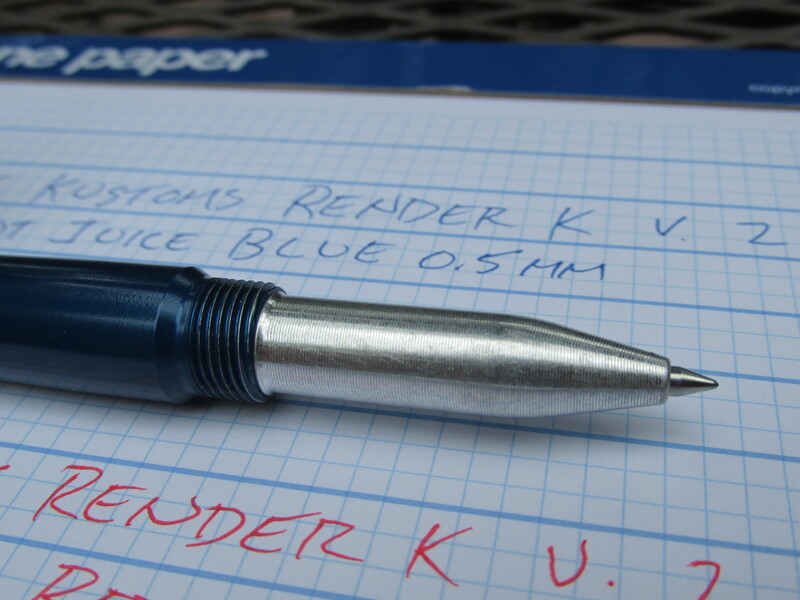 Although not exclusively, the next several reviews will likely focus heavily on mechanical pencils. If that’s not your bag, I hope you will stick around nonetheless. If it is your bag, I hope you will tell me what mechcils (see that – I’m inventing words now!) you enjoy and give me some ideas to explore. I won’t beat around the bush – this bullet pencil is not for me. Is it well made? Undeniably yes. Will I ever use it? No. 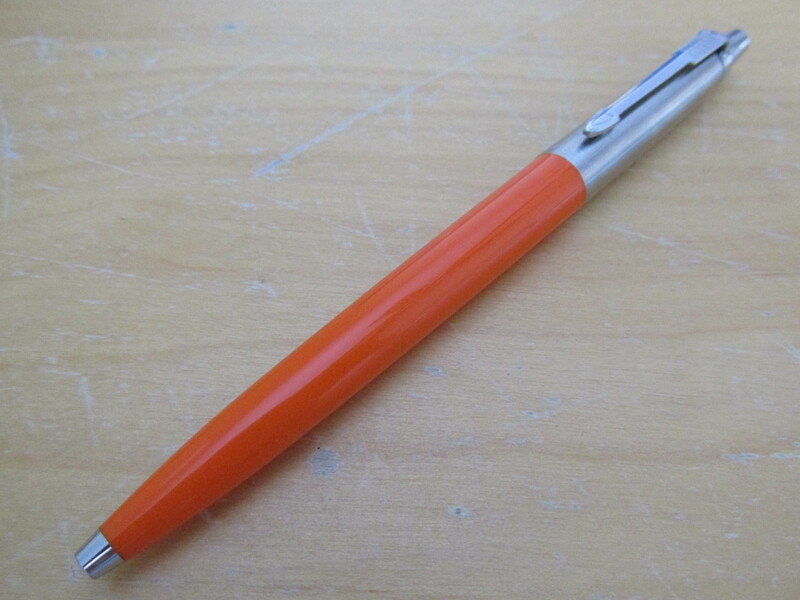 There are two aspects (one significant, one less so) that make the Bullet Pencil ST a no-go for me. Before I get to those issues, let’s talk about the Kickstarter campaign and the build quality. 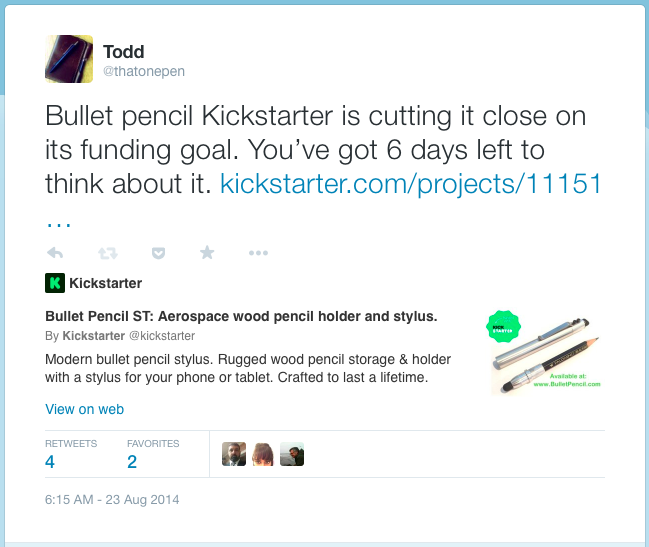 The Bullet Pencil ST was a Kickstarter project started by Jeff Grant. Taking a look at Mr. Grant’s website, it’s clear that this guy knows how to machine some unique products (combs, key fobs, wallets, etc.) that will last centuries. 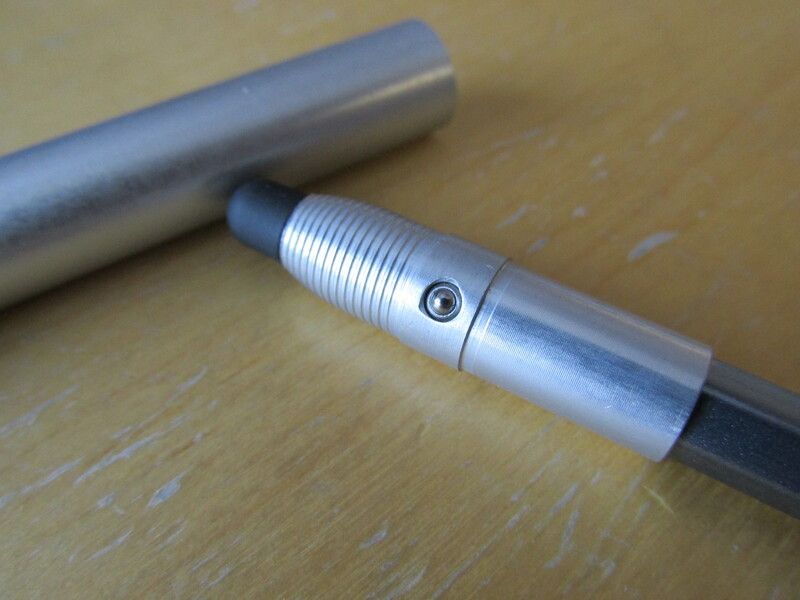 The Bullet Pencil ST appears to be his most recent Kickstarter project and while it was ultimately successful, things were a bit tight in the last week of the campaign. I even did my best to make sure it reached its funding goal. Now for the real problem with the BP ST – Balance. The balance is tilted too far to the eraser end to make writing with it comfortable or controllable. To quantify this issue, I measured the full lengths of a few writing implements along with the locations of their centers of mass. The numbers below indicate how far from the writing tip the center of mass is located. A number closer to zero means the implement is weighted toward the writing point. A number closer to 1 means the weight is, in pencil terms, closer to the eraser. 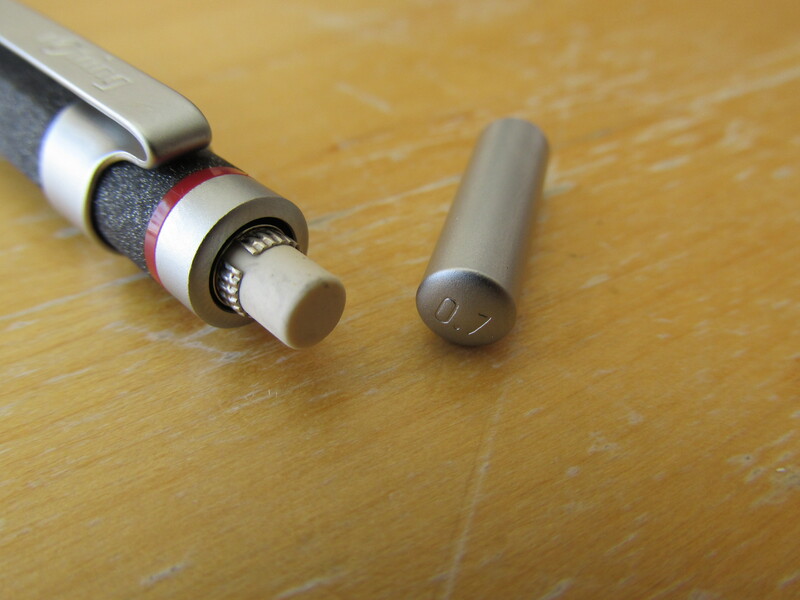 Bullet Pencil ST with a new stub…0.66!!! The weight of the BP ST is, compared to wood-cased pencils and another common bullet pencil, noticeably towards the eraser end. I don’t know about you, but I find writing with a fresh wood-cased pencil to be a bit awkward. 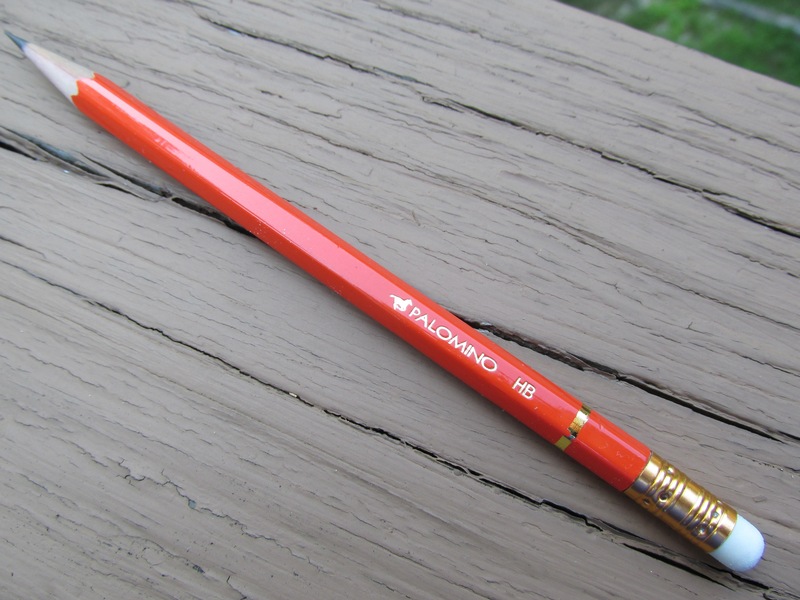 The length of a new pencil is 1-2 inches too long to be perfectly comfortable. As the pencil gets down to around 6 inches long, it feels much better as the center of mass is located within my hand while writing and not a half-inch or so above it. 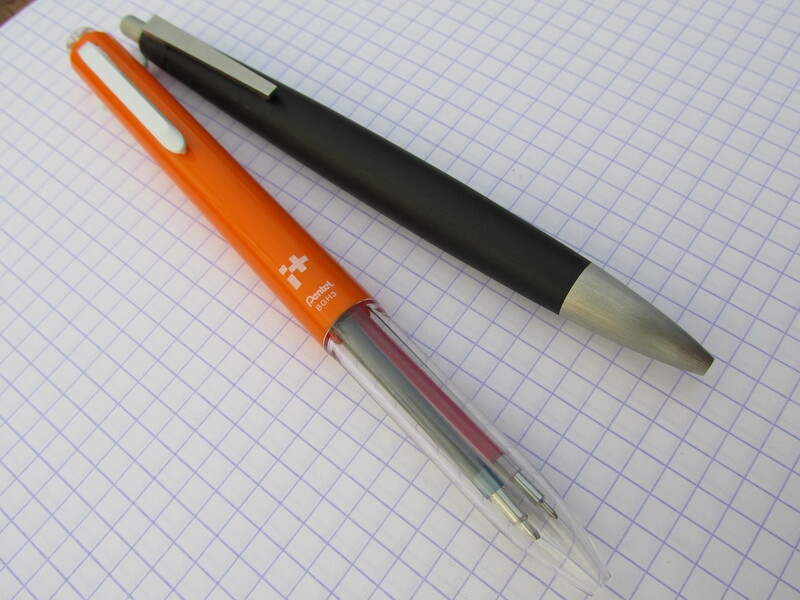 Unfortunately, with the Bullet Pencil ST, the center of mass will always be above my hand…awkward city! To understand what I’m getting at, try this little experiment. 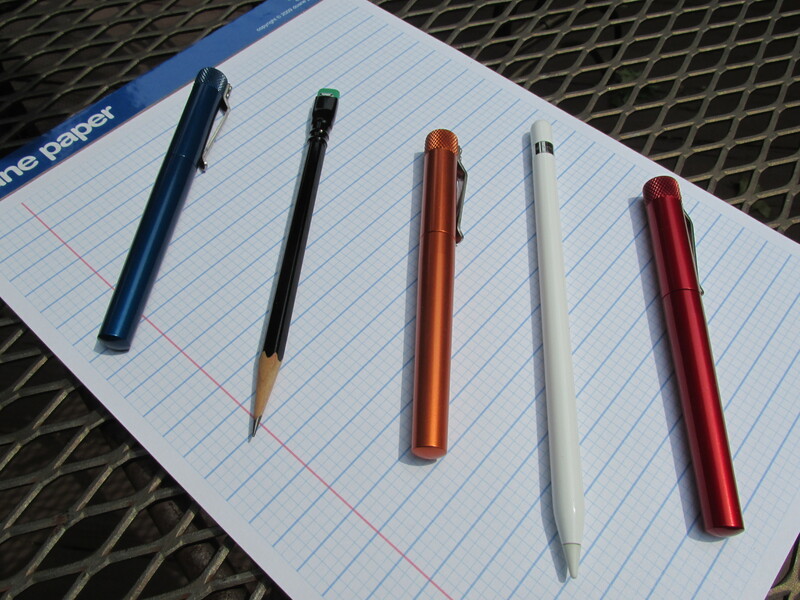 Get one of your favorite writing implements and hold it on a piece of paper as if you’re writing. Now, open your fingers and let go of the pen/pencil. 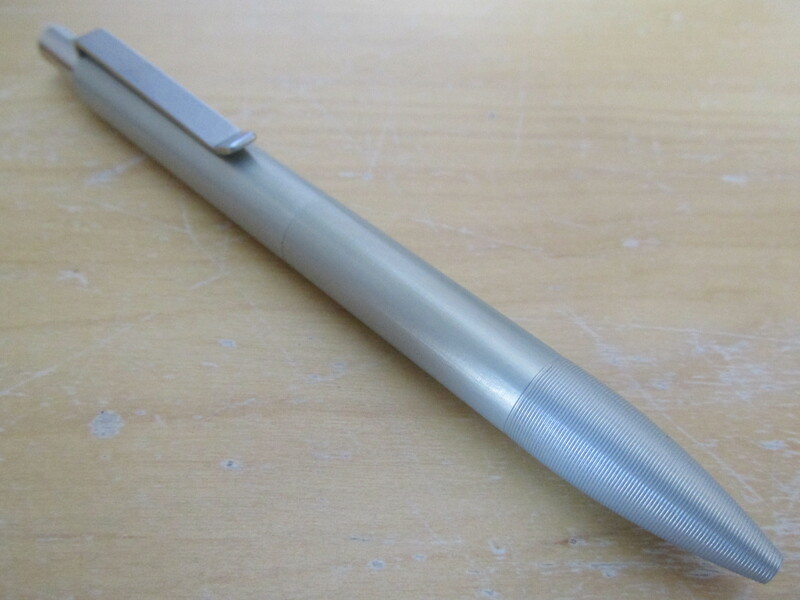 I bet you’ll see the pen/pencil stay put or slide down towards the paper. 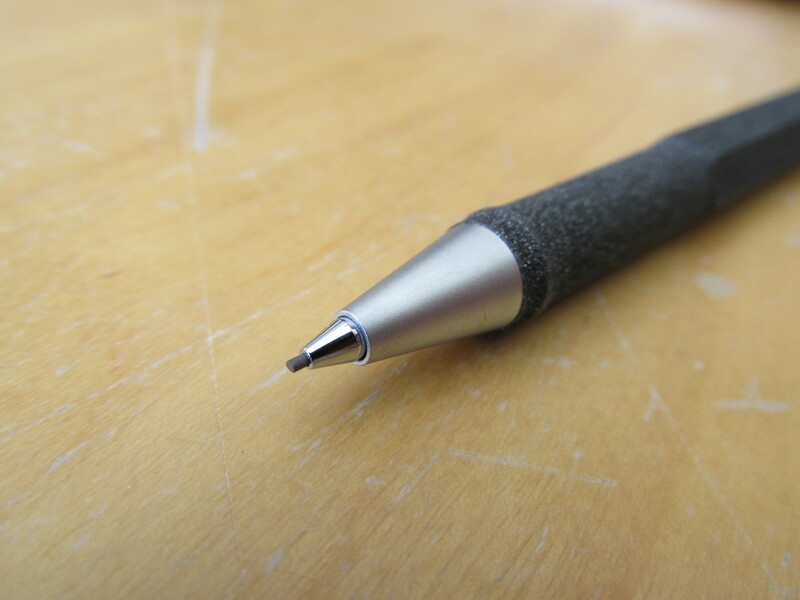 Even a new, full-length wood-cased pencil will stay put or slide towards the paper when you let it go. These observations suggest that the center of mass of the pen/pencil is somewhere within the space of your hand. When I do the same experiment with the Bullet Pencil ST, I don’t see a sliding down. Instead, the BP ST does a backflip away from the paper and out of my hand. In short, the balance is way off for me. Folks with noticeably larger hands than mine may not get the backflip, but men with average hands and typical grips will see what I saw as will the vast majority of women. Again, awkward city! 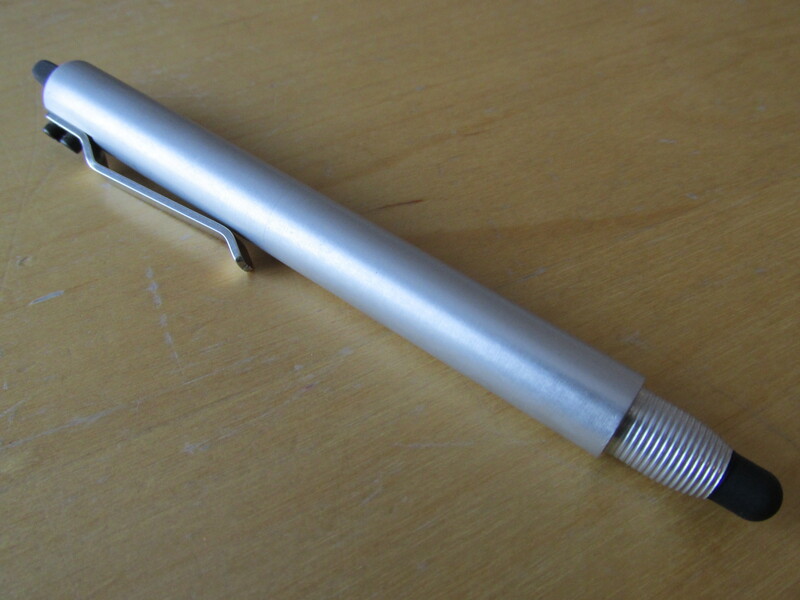 To conclude, the Bullet Pencil ST is an incredibly well made writing implement that I will never use.